The Grand Lake Theatre in Oakland, CA has been entertaining folks with movies and events that are relevant to the community since 1926. 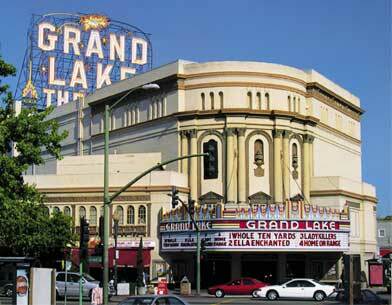 In addition to popular movies of the day, the Grand Lake Theatre hosts the Oakland International Film Festival each year. In 1980, Allen Michaan, purchased the ground lease of the property, and opened the theater with a single screen. He later expanded the theater to include three more screens. Starting with the day the U.S. Supreme Court stopped the counting of the votes in Florida, Mr. Michaan used the south facing marquee of the theatre for a message of particular interest to the people of the United States. In the past year, the south marquee has begun to sport a continuous stream of political commentary. The focus: Protecting constitutional rights of Americans, maintaining integrity and honesty in American politics and policies. Before long, elurie.com began photographing these marquees. The next step followed naturally. The images were added to the company's collection of greeting cards. Most recently these wonderful sayings have given birth to a couple of elurie.com posters. Click here to see the GREETING CARDS and here to see POSTERS.